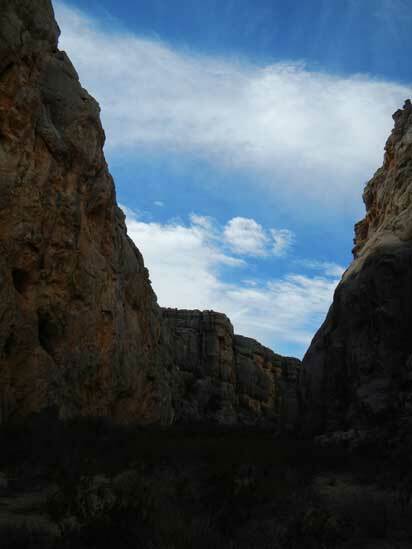 To get to the Trailhead for Dog Canyon Trail, head South about 3.5 miles from the Persimmon Gap Visitor’s Center. Park in the pull-off on the left with the roadside exhibit (find it here on your GPS 29.622407, -103.142906). If you pass a bridge, you’ll know you’ve gone too far. The trail is well traveled and easy to see from next to the exhibit. 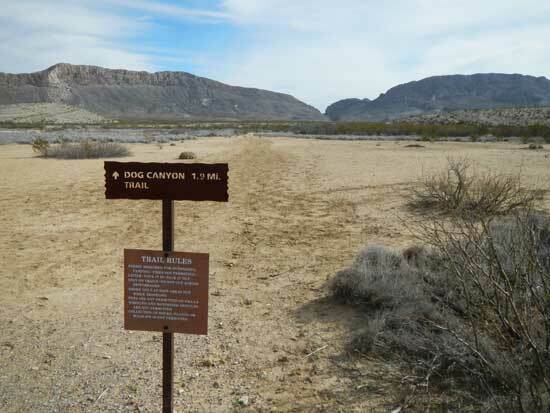 You should also be able to see Dog Canyon from the sign, so in truth, heading out there, the trail is almost unnecessary. You could just walk straight to it if you chose. 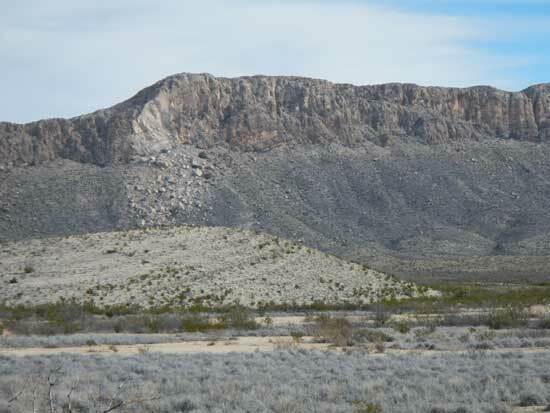 Slightly to the left (North) of Dog Canyon, you can see a giant scar on the mountainside. This happened back in 1987. For perspective, those boulders you see on the mountainside are almost two miles away. Some of them are the size of a small buses. The benefit of this landmark is that, since its easily identifiable, it should give you a good sense of direction when you see it. 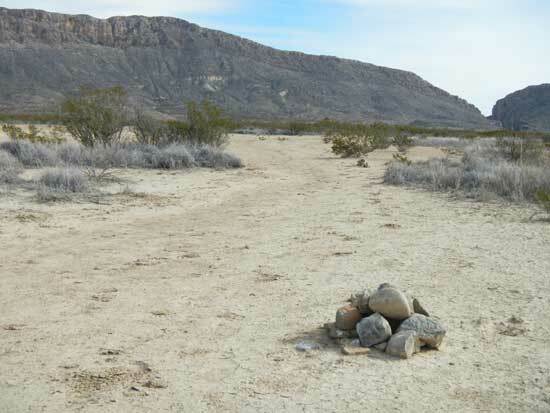 As you begin walking down the trail, you’ll see a number of rock cairns. These will help keep you going the right direction when the trail gets light and hard to see. 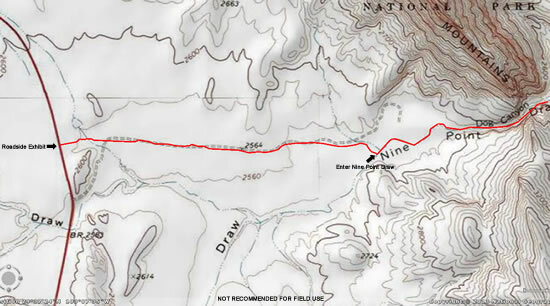 The large flat area that you’re walking across is called Bone Spring Draw. 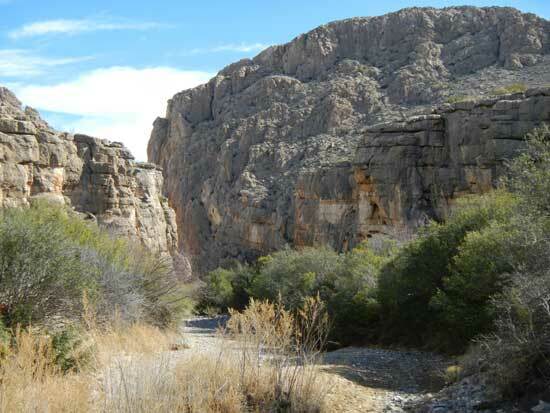 Your next destination is Nine Point Draw, which turns into a dry creek bed as it passes through Dog Canyon. You don’t want to be anywhere near this area in heavy rains. It can turn into a raging torrent. 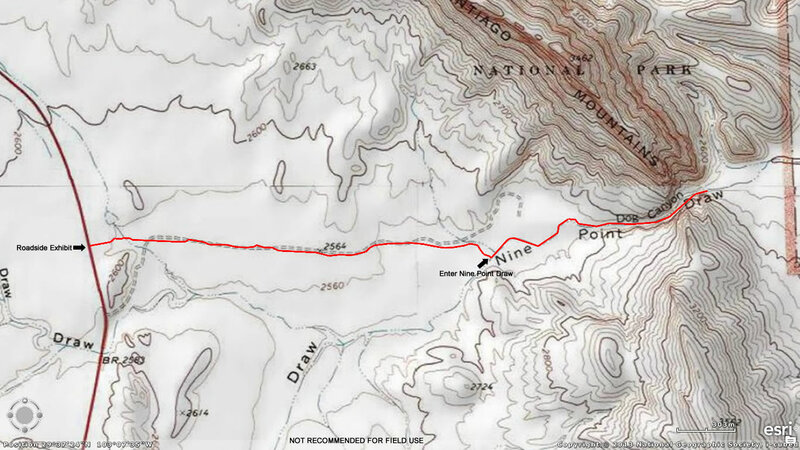 The trail will have a lot more brush around it as you near Nine Point Draw and will make a slight turn to your right just before dropping into the creek bed. 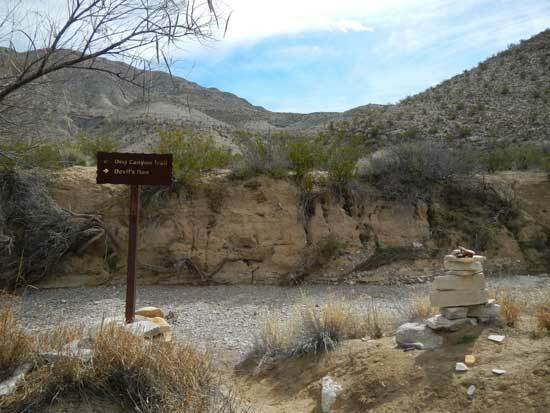 Once you reach the creek, you’ll see a sign (29.621957, -103.121424) pointing to Dog Canyon Trail on the left, and Devil’s Den Trail on the right. Walk down into the creek and hang a left. 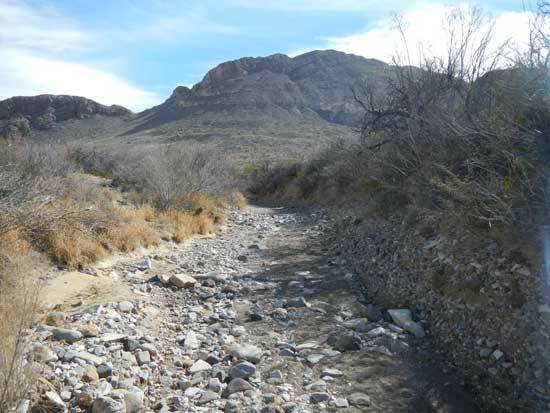 You’ll be able to follow this creek bed all the way into Dog Canyon. Make sure your boots are laced up tight. The creek bed gets rocky as you move along. 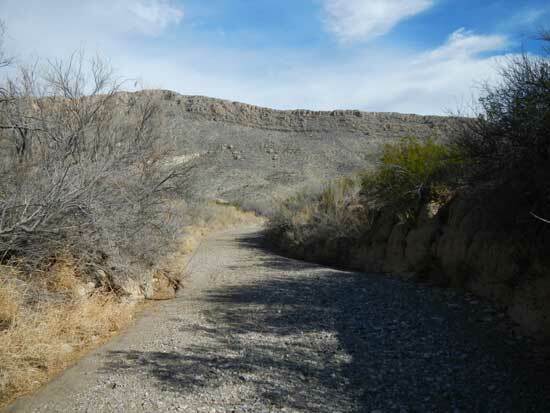 After about a quarter of a mile in the creek bed, you’ll start nearing Dog Canyon. You’ll notice the vegetation change slightly and become more lush. 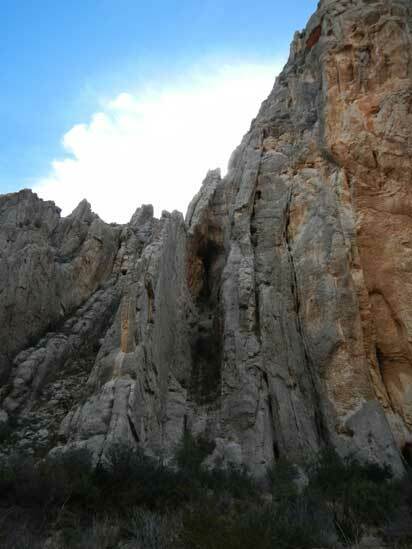 You’ll feel the wind pick up speed dramatically as it passes through the narrow canyon. If you want to sit and take a break, you may want to get through this part and out the other side into the flatter area before stopping. Photographs don’t do the canyon any justice. It feels much more massive as you pass under the sheer walls. 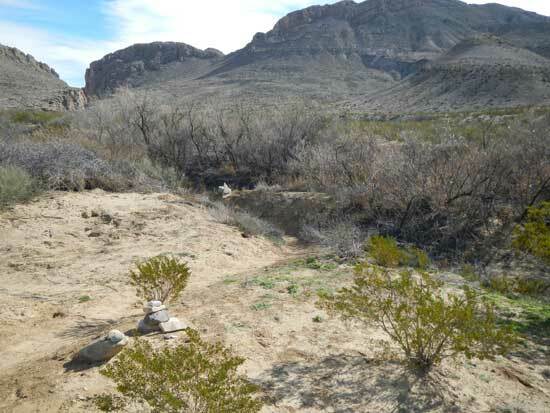 As you head back, keep an eye out for the rock cairns and sign marking the exit from the creek.